What has God done so far to prepare Israel for the Gog-Magog War? Nathan Jones: Ezekiel 38:11 reveals, so I'm going to skip a little ahead here, "You will say, 'I will invade a land of unwalled villages, I will attack a peaceful and unsuspecting people, all of them living without walls and without gates and bars.'" In Ezekiel's time, the nations were more nation-states or even city-states, so the people had to protect their cities, and they did that by putting giant walls around them. Jerusalem had a tremendous wall around it. Ezekiel is being given this prophecy by God and he's looking and he's seeing these cities in Israel and he's like, "They all have no walls! What's up with that?" He likely doesn't understand. With no walls then the people must be peaceful and so they are unsuspecting. When is Israel ever at peace or unsuspecting? They are constantly under attack due to war after war after war. Nearly 60 million Arabs want them dead. But, at some point, Israel has to be at peace. They're unsuspecting of a major attack and they are living without walls, gates and bars. Right now Israel has this tremendous wall that runs through it to keep the Palestinian terrorists out. So, when it comes to Israel feeling they're at peace, I don't believe that when we look at the end time timing that has happened yet. That means that there are still some more events that have to happen before this Gog-Magog War. 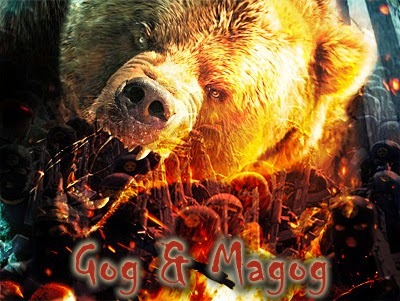 We are almost ready for the Gog-Magog War, but there are a few things missing. One, why are the nations surrounding Israel that are hostile towards it remain subdued and sit out this battle? Two, how can Israel be living in a time of peace and unsuspecting of a major attack against it? Those two things have to happen first before this war happens. Vic Batista: Good point! That was a reference to Ezekiel 38:14, "Therefore, son of man, prophesy and say to Gog, 'Thus says the Lord God: On that day when My people Israel dwell safely, will you not know it?'" Vic Batista: Nathan, you said that the word distress referred to the Tribulation, what about the phrase "Jacob's trouble"? Nathan Jones: Jeremiah 30:7 refers to the "time of Jacob's trouble," which is the Tribulation. This is also called the Day of the Lord. The book of Joel has two tremendous chapters about the Day of the Lord. It talks about this time of distress that Israel will have to endure. But, at the end, the Jews will return to God. I'm going to give you the ending to the Gog-Magog War here. When we get to the end of Ezekiel 39, Israel will turn back to God, but they will not have yet turned to Jesus Christ as their Messiah. So, the Tribulation is in part a catalyst to bringing Israel to their knees and finally accepting Jesus as Savior. God had to do that at times. He has to slap us up side of the head and say, "Hey, I'm working in your life. I'm glad you have accepted me, but you have not fully accepted Yeshua as Messiah, and that's got to happen." Vic Batista: People have to understand that God is not through with the nation of Israel. God still has a plan for them. In our community here in Miami we have thousands of Jewish people in the Aventura-Hallandale area. We are praying for them more and more all of the time because we know that God is not through with Israel. Nathan Jones: Not at all. As a matter of fact, when we get to the end of this Gog-Magog War, you're Jewish people living in Aventura area, they will be directly affected by the outcome. We will get to that later in the text, but know the Jewish people of the world after this war will want to return of Israel, in fact, they will feel compelled to. They will empty out of the different countries. I'm afraid that by then Aventura will be emptied of all the Jews. They will all want to go to Israel. I'm not making this up! This full return of the Jewish people is what we will be reading about in Ezekiel by the end of the war. Nathan Jones: Let's read Ezekiel 38:8, "After many days you will be visited. In the latter years," the end times, "you will come into the land of those brought back from the sword and gathered from many people on the mountains of Israel, which had long been desolate; they were brought out of the nations, and now all of them dwell safely." This is a direct prophecy to the Jewish people about being taken out of all the countries of the world and returning back to Israel. They will take a land that had been desolate and make it fruitful again. We have been seeing that very thing occur since Israel became a nation again. Their people have been moving back to the land of Israel and they have been taking the land that was left desolate for hundreds of years and making it fruitful today. Wow! Vic Batista: You've pointed out something very important regarding how many millions of Jews have come to know the Lord and have come back into the land from the establishment in 1948 and again in 1967. Like millions? Nathan Jones: Yes, the return of the Jews all started in the late 1800's with the First Zionist Congress. Theodore Herzl wrote a pamphlet called Judenstaat, or in English The Jewish State. It was about how the Jews were never accepted in any country. Anti-Semitism reigned, though people tolerated the Jews up to some point, but mostly hated them. Herzl believed it was time for the Jewish people to get their own country. It took all the way to 1948 for that dream to be realized. The United Nations gave the Jewish people only a third of the land that the UN promised them. The rest went to Trans-Jordan, or Jordan as it's called today. When people say that the Palestinians need their own state, well, the UN gave them Jordan. Jordan is the Palestinian State. That the so-called Palestinians need yet another state is just nonsense. Ezekiel's prophecy is absolutely amazing because it requires the Jews to all come back to the land of Israel. Right now about half of the world's Jews have relocated to Israel, so about 6 million. The prophecy also required that the Jewish people restore a land that was left desolate, which happened due to the Romans. Again, Ezekiel prophesied this almost 700 years before the Romans desolated the land. And, the Jews did it! They restored the land of Israel back to fruitfulness. You can go to Israel today and see that the Jews have made it a garden once more. Vic Batista: That is so cool! I haven't been able to go to Israel yet, but I'm hoping by next year we can go. I've seen photos, and you've been there a number of times to corroborate the fact of the fulfilled prophecy, which is just amazing. Nathan Jones: I've been to Israel three times, and when you go throughout the land of Israel you just can't believe it was ever a wasteland for centuries. You would have to read up on the history to understand just what a tremendous amount of work and suffering the Jews had to put into that land to restore it. What was just left originally was a wilderness in some places and swamps in other areas. The Jews used their know-how and their technology and they restored that land. Everywhere you go throughout Israel there are flowers, fruit, and palm trees. It's just like Miami; it's wonderful! Vic Batista: So, Israel is a little Florida, but with the blessing of the Lord? Nathan Jones: It is. I used to live up in the Orlando area when I was real little. I do try to remember parts of Florida, and it was a blessing to go down to Miami to see you this past year. You are right I think, Israel is a lot like Miami, because they are both tropical and on the ocean, and they are both beautiful. So, for you folks living in Miami area, it's like living in Israel. Vic Batista: It's a nice place, except for August. Nathan Jones: Yes, well, Israel does have its hot months as well. Back to it, the prophecy there in Ezekiel 38:8 is just amazing. Ezekiel is passing along God's message to this leader Gog, this warrior who will lead this war against Israel. Then verse 9 reads, "You will ascend, coming like a storm, covering the land like a cloud, you and all your troops and many peoples with you." So, we know that when Russia leads a coalition of nations against Israel, they will be an overwhelming force. This coalition will be like a storm. It will be like when you look out on the horizon and you see the black clouds heading towards you. That's what it will be like for Israel. Israel will see an army, actually a combination of armies, descending upon them overwhelmingly with Israel having absolutely having no way to defend themselves against such an onslaught. Israel will face its most dire attack since the Romans destroyed Jerusalem and the Temple in 70 AD. In the seventh segment of our study of the Gog & Magog War of Ezekiel 38-39, Vic and I look at where this battle fits into the "latter years."